The Billboard charts tabulate the relative weekly popularity of songs or albums in the United States and elsewhere. The results are published in Billboard magazine. Billboard biz, the online extension of the Billboard charts, provides additional weekly charts. There are also Year End charts. 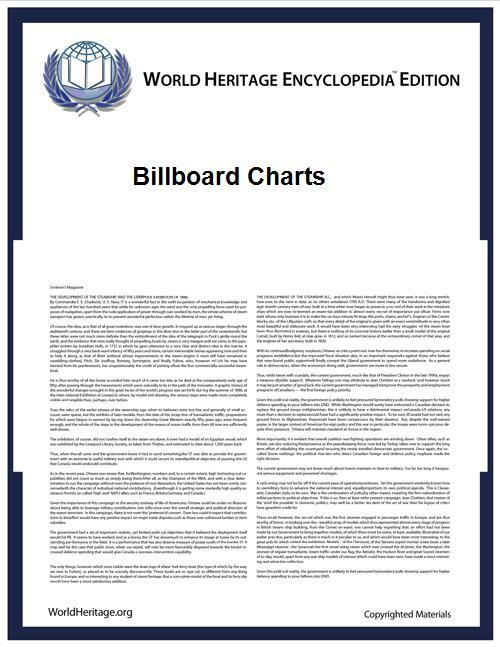 Originally, Billboard had separate charts for different measures of popularity, including disk jockey playings, juke box song selection, and best selling records in retail stores. A composite standing chart that combined these gradually grew to become a top 100, the predecessor to the current Hot 100 chart. The juke box chart ceased publication after the June 17, 1957 issue, the disk jockey chart, after the July 28, 1958 issue, and the best seller chart, after the October 13, 1958 issue. The July 28, 1958 issue was also the last issue that called the composite chart the "Top 100"; the following week began the "Hot 100". Billboard publishes many different charts, with the Hot 100 and Billboard 200 being the most famous. Billboard also has charts for the following music styles: rock, country, dance, bluegrass, jazz, classical, R&B, rap, electronic, pop, Latin, Christian music, comedy albums, catalog albums, and even ringtones for mobile (cell) phones. In 2009 Billboard partnered with MetroLyrics to offer top 10 lyrics for each of the charts. In December 1998, the policy was further modified to allow tracks to chart on the basis of airplay alone without a commercial release. This change was made to reflect the changing realities of the music business. Previous to this, several substantial radio and MTV hits had not appeared on the Billboard chart at all, because many major labels chose not to release them as standalone singles, hoping their unavailability would spur greater album sales. Not offering a popular song to the public as a single was unheard of before the 1970s. The genres that suffered most at the time were those that increasingly impacted pop culture, including new genres such as trip hop and grunge. Among the many pre-1999 songs that had ended up in this Hot 100 limbo were The Cardigans' "Lovefool", Natalie Imbruglia's "Torn", Goo Goo Dolls' "Iris", OMC's "How Bizarre", Sugar Ray's "Fly" and No Doubt's "Don't Speak". Hot R&B/Hip-Hop Songs 50 Ranks the most popular by combining airplay from All formats of radio stations, digital download sales, streaming data and YouTube views of R&B and hip-hop songs. Hot R&B/Hip-Hop Airplay 50 Measures airplay based on audience impressions from various R&B/hip-hop stations. Mainstream R&B/Hip-Hop 50 Ranks songs by combining airplay base on radio plays (spins) from 76 R&B/hip-hop stations. Adult R&B songs 20 Measures airplay from 65 Urban AC radio stations. Hot R&B/Hip-Hop Singles Sales Sales component of Hot R&B/Hip-Hop Songs. It is a separate panel of sales of commercial 12" Maxi singles in the urban market. Bubbling Under R&B/Hip-Hop Singles 10 Ranks the top 10 songs below #50 that have not previously appeared on the Hot R&B/Hip-Hop Songs chart. Hot Rap Songs 25 Ranks the top 25 hip-hop/rap songs by combining airplay from All formats of radio stations, digital download sales, streaming data and YouTube views of rap songs. Hot R&B/Hip-Hop Recurrents Ranks songs that have fallen below No. 50 on Hot R&B/Hip-Hop Songs and have been on that chart for over 20 weeks. Hot R&B/Hip-Hop Recurrent Airplay Ranks the songs that have fallen below No. 25 on the Hot R&B/Hip-Hop Airplay chart and have been on that chart for over 20 weeks. R&B Songs 25 Ranks the top 25 R&B songs by combining airplay from all formats of radio stations, digital download sales, streaming data and YouTube views of R&B songs. A 100-position chart is available at Jam! Canoe website. Ranks the best-selling Latin albums weekly. To be eligible, an album must have at least 50% of its content recorded in Spanish.